The Philadelphia Flyers will be well-represented at the 2016 World Cup of Hockey. Jake Voracek, Radko Gudas and Michal Neuvirth will all suit up for their native Czech Republic, while Mark Streit and Sean Couturier will participate for the newly created Team Europe and Team North America, respectively. Yet it’s perhaps the two biggest contributors to the Flyers’ success this past season that are still waiting to find out if they’ll play in the World Cup: forward Claude Giroux and defenseman Shayne Gostisbehere. Giroux is a Team Canada hopeful and Gostisbehere falls under the Team North America umbrella as a 23-or-under player hailing from the United States. When the preliminary rosters were announced on March 2 the pair were left off of their respective rosters. The news wasn’t a huge surprise then given the depth of both rosters, but since that point Giroux and Gostisbehere helped lead the Flyers to the playoffs and, in an odd coincidence, both had surgery on their hips and abdominals. However, both are expected to be healthy and skating again when the World Cup rolls around in September and both players’ chances of making the final rosters are still up in the air with the final roster announcement coming this Friday, March 27. Giroux led the Flyers to a surprising playoff berth between March and April, but come playoff time, the Flyers captain vanished on the score sheet. It’s likely that the hip and abdominal problems played a part in that, but one point in six postseason games won’t look good to the Team Canada brass. 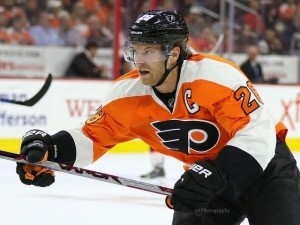 Besides his own struggles, the play of others may also play a part in Giroux’s chances of making Team Canada. While the 28-year-old recorded a single assist in the playoffs and then had surgery, Logan Couture and Joe Thornton have gone deep in the playoffs while Brad Marchand, Brendan Gallagher, Corey Perry and Ryan O’Reilly led Team Canada to gold at the World Championships. Claude Giroux remains a Team Canada hopeful (Amy Irvin / The Hockey Writers). Giroux also won gold with Team Canada at last year’s World Championships, but the above group did it at a more recent tournament. The Hearst, ON native also had a down year statistically with his lowest point-per-game average since his sophomore season. However, while his offensive stats took a dive this season, Giroux took on a more defensive role with the club and that may be his biggest hope in making the Canadian team. Names like Alex Ovechkin and Nicklas Backstrom didn’t show up often in the playoff stat sheets in the Washington Capitals’ opening round matchup against the Flyers because Giroux played most of the series against them. His faceoff numbers are also among the top of the league with a 57.5 win percentage. Giroux would be a perfect fourth-line option for this team. He can play center or right wing, take faceoffs, stifle opposition and move up the lineup if need be. Now, whether Team Canada sees Giroux as more capable of those roles than other players is another question. Luckily for Gostisbehere, the North American defense isn’t as deep as the Canadian forwards. The four already named (Aaron Ekblad, Morgan Reilly, Seth Jones, Ryan Murray) have plenty of experience, but don’t have the puck-moving acumen of Gostisbehere. The 23-year-old defenseman turned heads all year with the way he could turn a puck up-ice whether by his skating or through passing. It showed with his 46 points in 64 games. Gostisbehere was one of the Flyers’ best defensemen in the playoffs – and not just in the offensive zone – but his offense dried up a bit, with only two points in six games as the whole team struggled to find the back of the net against the Capitals. As for the other Team North America hopefuls, Colton Parayko seems to have nailed down a spot as his strong showing in this year’s playoffs with the St. Louis Blues continues. That leaves two other spots with Gostisbehere, Dougie Hamilton and Jacob Trouba in the mix. The Florida native, however, brings the most offensive prowess and the ability to play on the top power-play unit despite less experience than the other two. At this point it seems that a spot on Team North America is in the bag for Gostisbehere. The rookie phenom will just have to wait a couple of days to see if that indeed comes true.